Some fans may have left Viejas Arena after SDSU’s Tuesday victory over the Cowboys unimpressed. A 28-11 start wowed the crowd; Wyoming came storming back with a 13-0 run to close the half. But the Aztecs stabilized in the second half as they turned in their best second half performance of conference play. Montaque Gill-Caesar had his coming out party in that second half and finished with 12 points. Gill-Caesar nearly sent the crowd into a frenzy as he tried to cram one over a Wyoming defender after a steal by Malik Pope. Something entirely different was my sound of the night, and it didn’t come from a player. You could hear several members of the coaching staff getting after SDSU players to move without the ball as they leaned more on a 4 out attack around Pope. No sleepwalking through old sets and more reacting were in order. This senior captain is shooting 54% from the floor this season. He shot 39% as a junior. Allen been a man on a mission in conference play, perhaps emboldened by his 17 points on the road at Boise. Injuries have really hurt this team. As we move forward, maybe it’s time to begin noticing the good that has come from those extra minutes passed on to others as a result of those injuries. As Steve Fisher has noted, the Aztecs essentially finished that Boise game with five bodies. The team was in comeback mode against a softer defense and Allen saw the opportunity. As a bonus: The guy that still draws groans rising up to shoot a three (10-36 this season) is 6-14 from out there in conference. Allen’s sample size is a small one from out there. Remember, if he had hit two more of his attempts this season, he’d be at 33% and no one would be giving him grief. The junior forward has always had two clouds lurking over the top of him. Injuries and NBA hype. He’s continuing to battle back from the former and the latter has always been out of his control. After missing the team’s first four conference games (SDSU went 1-3), Pope returned. His teammate and close friend Zylan Cheatham has missed the last two. As a result, Pope has room to operate from the block at will with four players around him. One of the largest criticisms of Pope’s game from scouts remains his feel for the game offensively. But put him 14 feet out with his back to the basket against an over-matched defender and he is right at home. Pope is 12-18 from the floor and 10-14 at the line over his last two. From the block, his approach seems much more binary. He’s going to work his way to an arm’s reach of the rim or whip a pass to the weak side the second he gets doubled. Pope has been very willing to do the latter and has only turned it over three times across 54 minutes of action. The team has expressed its desire for Cheatham to get back soon. But when he does, they’ll need to find a way to keep feeding it to Pope inside with room. Matt Shrigley missed a three with 10:26 left against Wyoming. He was wide open. This isn’t a rant against Shrigley or a study of his shooting tallies. It’s a celebration of how he got that look. Montaque Gill-Caesar, who is very good at getting half a step on his defender despite being largely ignored from beyond the arc (see Allen, Dakarai), worked his way down the baseline from the left corner. Gill-Caesar rose up around the basket, possibly to finish a reverse layup? He could have. Instead, he fired it to Shrigley, who was standing all alone in the opposite corner. The staff does very little to install and run sets for Shrigley and Max Hoetzel. Those guys have to run the floor and just be at the right place at the right time to find open looks, making that site from Tuesday night a welcome one. Four out around Pope stretches a defense thin. Pope moves around much more than Cheatham or Valentine Izundu when he senses that his teammate is starting a drive. Far too often, a help defender can cover up Cheatham/Izundu and still be in a position to get out to a shooter on the perimeter. This is a very, very small lesson in spacing, but it matters for a team that needs to continue to scrape more points together. Winding up at 77 in each of their last two is a good start. The Aztecs will need some more of that at Fresno State. 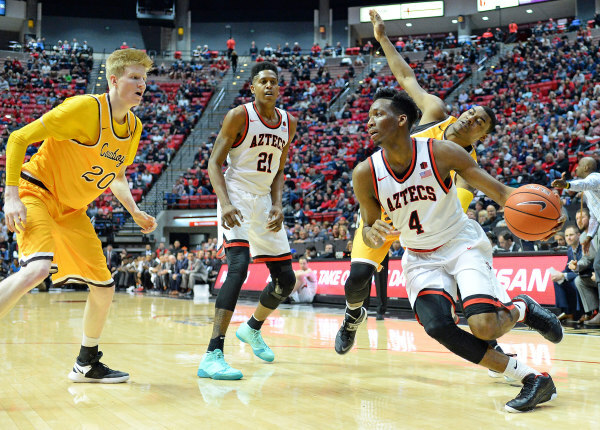 After losing up there twice in a row and falling just short in the MWC tournament final to the Bulldogs last season, the time is right for the SDSU to strike.